As you can see this is quite a dramatic colour difference from the last NOTD post! I love this look and usually recreate it with slight variations at least once a month. Black nails on their own can sometimes be a little too harsh, so I like to add gold glitter to break up the colour. Today I've gone for a feature nail, but you can also do this look on all the nails too (which I love to do if I'm going to a party or a special occasion!). I think it would also look great with any other colour of glitter polish, or even with a different base colour if black is a little too dramatic for you. 1. You want to start off with an undercoat to avoid staining you nails. Then paint your nails with a black nail polish with enough coats to make sure it's opaque - I use Barry M Nail Paint in NP47. 2. Next you need to paint the tip of your nail (like you would for a French manicure) with a gold glitter polish - I use Barry M Gold Glitter Nail Paint (NP339). You could even finish the look at this step if you fancy a twist on the classic French manicure! 3. Now you need to wipe the brush clean and lightly spread the glitter polish from the tip down to about 1/2 to 3/4 of the nail. Finally dab a little more glitter polish at the tips of the nail, allow to dry, and finish off with a thin layer of your favourite top coat! Do you like black and/or glitter nail polish? Would you ever try a look like this? I love the gold onto of the black! I tried out some glitter gradient nails before but didn't think of putting a colour underneath. I love this! Glitter gradients are so pretty :) Great colour choices, too. I love them! You have such beautifully shaped nails, too. My boyfriend would go batshit for these - he's a huge Saints fan, so black & gold everything is the way to go! OOOO must try this nail look. Great job! Love this! Just followed you on bloglovin, found you from the #bbunch link up. Oooh so cute! I love black nails. 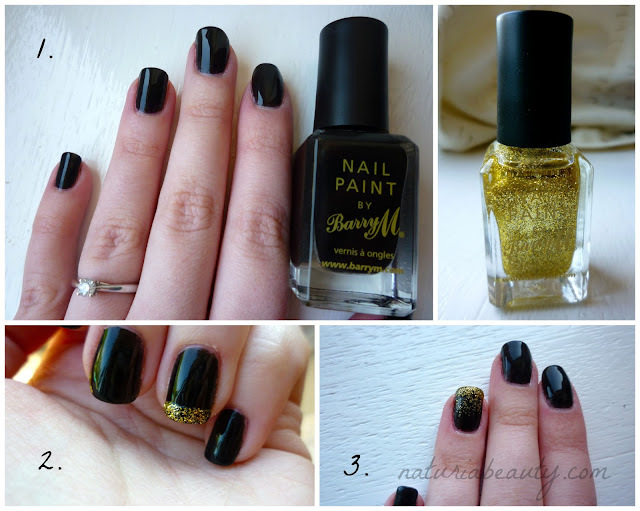 these are so pretty, the barry m gold glitter nail polish looks so amazing - i must have it in my collection!